Amazon donates $10,000 of BotBall robotic equipment to F.D. Moon Academy. 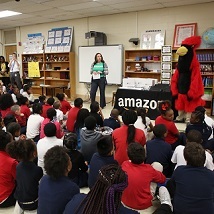 Amazon visited a local Oklahoma City school, F.D. Moon Academy, to surprise students with a $10,000 donation of BotBall robotic kit equipment. The BotBall program focuses on designing, building and programming a pair of autonomous robots to solve different challenges. The program will expand the school’s science, technology, engineering and math (STEM) program as the first robotics program at FD Moon Academy. The donation takes place after Amazon opened its doors in Oklahoma City in Oct. 2017 and included items such as Junior BotBall Challenge robotic kits and game surfaces with curriculum, Chromebook tablets, and a Tech Tub2 Trolley.